A condition where there gums around the teeth fade away or recede, exposing more of the tooth surface is gum recession. Why do gums recede? Periodontal diseases cause gum recession as the bacteria infect the mouth, destroying gum tissue and the bones that support the teeth. This gum disease is the main reason for receding gums. This condition is genetic, so if your parents have this condition then chances are you are more susceptible and may already be predisposed to gum recession. What effect does gum recession have? When there is a receding gum line, because the gum pulls away it exposes more of the tooth surface. 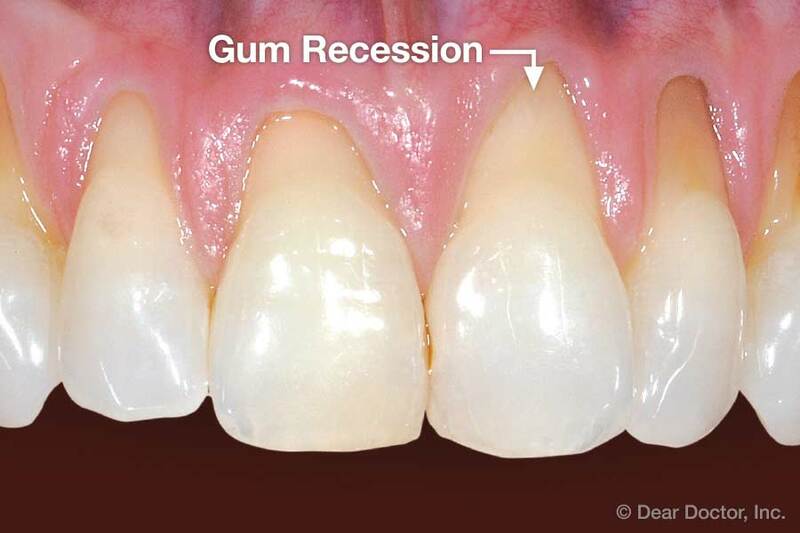 This recession forms gaps or pockets between the gums and teeth making the area more prone to infections due to bacterial build up. If the bacteria is allowed to accumulate, they begin to affect the gum tissues and gradual eat into the supporting bone as well causing significant damage, leading to tooth loss. In more serious cases, gum surgery might be required to repair the damage caused. This includes procedures like regeneration of damaged/lost bone, scaling of gum tissue and grafting.